Swimming pools these days come in all shapes and sizes. Solar pool covers, then, will need to be adaptable. The application round has begun! Bubble blankets are most commonly available in either round, oval or rectangular shapes; great for cookie cutter pools. 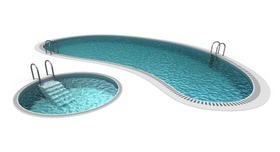 For uniquely shaped pool, plastic pool blankets can usually be cut to fit, or special ordered to fit the exact dimensions and shape of your pool. This process will either increase the workload or the price. Liquid pool covers, on the other hand, will spread out to cover any size or shape of swimming pool without any added work or cost. You simply need to dose the recommended volume for the square footage of each individual pool, and the liquid cover will do the rest of the work. Conventional solar blankets need to be placed on the surface of a pool's water in order to achieve any results. This process, on a rectangular pool, will involve pulling or spreading out the plastic from one side of the pool to the other. Plastic blankets are often rather heavy, even when they are not much more than bubble wrap, and become more-so if they are wet and sticky from previous use. On a uniquely shaped pool, spreading out a plastic solar blanket will become even more tricky, as you try to line up the shape of the blanket to the pool. Once the blanket is adequately covering the pool, it should be secured in some way, in order to ensure it will stay put to give you the best results possible. Depending on the size and shape of your swimming pool - and your experience with application - simply placing a conventional pool blanket on your pool could take upwards of 15 minutes out of your day. Once the blanket is on your pool, when you decide you would like to take a dip, you will have to remove it. Some pool owners and operators will invest in a reel to help the process, and this works well with rectangular shapes. The more curves in your blanket, however, the more difficult it will be to use a reel. Even with a reel, the process of pulling a wet plastic blanket off your pool is a heavy job. If you have a pool that doesn't adhere to the cookie-cutter shapes, you will more likely be struggling to pull the blanket off the water manually, folding it or rolling it as you go. For most pools, this will either be a multiple person job, or will take a good span of time to complete. You will be wet from the effort though, so it will be a great time to jump into the pool if you are not already too exhausted to swim! Just watch the following video showing 2 people pulling a solar cover off of a swimming pool - and keep in mind, this is the effort involved with a rectangular pool. Are you up for this kind of work every time you want to swim!? In comparison, here is the process of using a liquid pool cover. This once-a-week application should take you less than 2 minutes, with no heavy lifting! The initial, one-time installation and programming of the metering system may take up to 1 hour of time. After it is installed however, all you will ever need to do change out the bottle of Heatsavr when it is empty...maybe taking a minute or two of your time, with no heavy lifting. The overall ADVANTAGE for the Application Round goes to liquid pool covers. Not only will they automatically adjust to fit any size or shape of swimming pool, but there are 3 user friendly applications options to choose from, none of which require any heavy lifting and only very minor mathematical skills. In the final round, the battle ground turns to Price. Stay tuned!